in our modern times we are all experiencing the rapid, forced advance of globalization in its various forms. Could it be, though, that global mechanisms so huge and complex as the ones behind globalization would ever lead aside religion, which by all accounts is the most decisive factor, the catalyst, in social affairs and complications? Does Ecumenism, as a religious movement that gradually–though very steadily–commingles religions and denominations into an almost uniform whole by eroding the dogmatic self-awareness of very diverse religious groups, have to do with globalization or not? Secret societies, especially Freemasonry as the predominant among them, have started publicizing ample information on their membership, documents that were formerly strictly classified. Thanks to this development, we can trace the activity of some very prestigious Ecumenist clergymen and theologians, within the Ecumenical Patriarchate and the Church of Greece, back to their Masonic status and pro-Masonic disposition. By way of comparing some distinctive aspects of their thoughts and on-the ground-activity, with official Masonic accounts and maxims that e.g., disparate the Church dogmas, proclaim an imminent unification of religions etc., it seems that the alleged capacity of those Churchmen as Freemasons or Theosophist can be fully ascertained. This paper focuses especially on the cases of the renowned Greek Patriarchs Joachim III of Constantinople (1878-1884 & 1901-1912) and Meletios IV (of Constantinople 1921-1923 % of Alexandria 1926-1935), and the illustrious Greek Professors of Theology Nikolaos Luvaris (1887-1961), Dimitrios Balanos (1877-1959) and Amikas Alivizatos (1887-1969). It outlines their immediate or intermediate contributions to Ecumenism and exposes the tactics they employed to achieve goals. Their era, the first decades of the 20th century, was marked by a vigorous and global Masonic and Theosophic effort to promote not only inter-religious and inter-Christian Ecumenism, the WCC being the most notorious manifestation thereof, but also an embryonic Global Government (League of Nations). Even though this paper relates developments which only pertain to Greek Church affairs, the author has come across evidence relevant also to Russian Theology and the Romanian Church, fields of a possible future research. It seems, though, that Freemasonry and its kindred societies, eventually free from centuries-old persecutions by Kings and Popes, have nowadays the insouciance to disclose more and more of their own hermetically sealed secrets regarding their infiltration in various social, political, economy, cultural and religious structures. For instance, Manfred Agethen’s book Secret Society and Utopia, a detailed research concerned in the implementation of the Illuminati plan in the late 18th century to take over the German State, is indicative of this new, revised, approach to historical events. (6) One more example is the Masonic institution COMALACE (Contribution des Obediences Maconniques Adogmatiques et Liberales A la Construction Europeenne), an association of militant Masonic jurisdictions, which functions in our present days in the courtyard of the EU. (7) So, it incarnates in a very official way, the prominent role Freemasonry is expected to play in future developments in Europe, aiming at the secularization of the formerly Christian societies of our Continent. On the theoretical grounds, Freemasonry, Theosophy and Rosicrucianism have always propounded their contempt of Church dogmas, purporting to establish a philosophical or Gnostic Christianity instead–in other words a so-called “esoteric” and “tolerant” Christianity–to befit their own religious relativism (it is all about the old Masonic motif of “the good, loving, humble Jesus” versus “the hateful, conceited, intolerant Church of the Clergymen” (8) or as put otherwise: “more Christianity and less Orthodoxy” (9)). The practical ramifications of such an occult approach to the religious aspect of globalization, militantly undermining the basis of Christian Faith, can not be somewhat better elucidated, thanks to the abundance of relative sources; these were declassified due to the feeling of safety that occult societies nowadays enjoy. 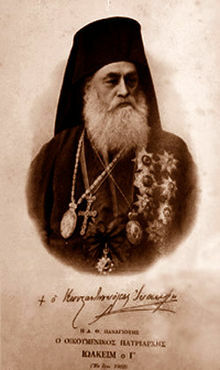 Patriarch Joachim III of Constantinople (1878-1884 and 1901-1912); he is referred to as a Freemason in various Masonic sources; for instance in the official website of the Grand Lodge of Greece (15), in Manolis Fysentzides’ work (in two volumes) Illustrious and Famous Greek Freemaons 1880-1970(16), and also in the Encyclopedia of Freemasonry by Nestor Laskaris (1951), republished (2001) as The Black Lexicon of Greek Masonry by a former Freemason and later anti-Mason writer and journalist, the late Basil Lamprodopulos. (17) What I consider to be unshakeable pieces of evidence in this context, though, is firstly a very short reference to Joachim’s membership in the Lodge Progress(«Πρόοδος»), noted among personal diary records of the renowned Greek Mathematician Konstantinos Karatheodori (Fysentzides concords on Joachim’s membership in that same Lodge (18)). Karatheodori (1873-1950) is believed by many to be the tutor of Albert Einstein. His diary was published as an appendix within a monograph written by Maria Georgiadou(19) . The diary-keeper, Karatheodori, probably also a Mason himself, since he was aware of his fellow-Masons affiliation with certain Lodges, testifies through this diary to the Masonic capacity – among others – of Patriarch Joachim III, also of professor of Theology Dimitrios Balanos (see further below) and the renowned Greek Politician Eleftherios Venizelos. What I render significant in this diary notes, publicized almost 60 years after Karatheodori’ s death, is that they can’t have been part of a designed, misleading trend of Masonic propaganda. They are confidential notes for personal reference, and, thus, essential proof for the matter in question. One could also point out the fact that Karatheodori was the one to address and exalt Patriarch Joachim III with an appraising oratory upon his second enthronement on June 11th, 1901 (20) . The second most important piece of evidence is a Masonic inscription in plain view of the Greeks of Constantinople for the past 130 years. It is the Masonic “Square and Compass” embossed on one of the parapets of the tower of the Great School of the Nation (Μεγάλη τοῦ Γένους Σχολή) in Constantinople. The Masonic symbol decorates the name of the architect who built the Great School, Konstantinos Dimades (Κωνσταντῖνος Δημάδης) and the indication 1881 (the School was completed in 1882). The Great School of the Nation, actually, was built by decree of Patriarch Joachim III and under His auspice (21). It is out of question that this inscription could have ever escaped the notice of Patriarch Joachim III until His death, 28 years later(22). Given that He has been one of the most powerful Patriarchs in the last centuries and could have had this inscription removed at a small handgesture, it is only natural to assume that He gave His express or tacit consent for it. Patriarch Joachim’s second tenure (1901-1912) draw a seemingly indelible line between the Ecumenical Patriarchate’s past and its future as pertains to Ecumenism. Joachim’s ecumenistic approach to the division of Christianity was praised by His contemporaries; according to The Figaro’s obituary upon the Patriarch’s death: “His main concern was an approach as close as possible between the three great branches of Christianity, i.e. the Orthodox, the Catholic and the Protestant. In short, already within the first days of his second term of office he took up the role of a general pacifier among Christian denominations, basing his hopes on the commandment of Him that said ‘whosoever believeth in Me, must love each other as brethren’ ”(23). Since His second inauguration in 1901, never again has Freemasonry or any other Secret Society been condemned by the Patriarchate of Constantinople, nor have any of the heretical Christian denominations, in contrast to previous Decrees issued in common by the Patriarchs of the East(24) . His greatest contribution to the Ecumenical Movement and the heresy of Ecumenism was His famous Encyclical of 1902, which is recognized as their starting point(25); therein Patriarch Joachim clearly attributed ecclesiality to Papacy and Protestantism alike, naming them “churches” and “great offshoots (suckers)” of Christianity, at the same time avoiding very subtly to define the Orthodox Church as the ancient One, Holy, Catholic and Apostolic. Instead, and contrary to the Orthodox doctrine(26) , he places further in the future the realization of the Lord’s words, that there shall be “one flock and one Shepherd” (John 10:16), when all Christian denominations unite with each other. In His own words “Furthermore, it is God-pleasing and in accord with the Gospel, to explore how the most holy autocephalous Churches assess our present and future relations with the two great offshoots of Christianity, in other words the Western Church and that of the Protestants […] the Holy Church is one in reality [defined] in an identical Faith and in likeness of mores and customs, in concordance with the decisions of the Seven Ecumenical Councils, and ought to be one, and not many and different from each other as regards their dogmas and fundamental institutions of ecclesiastical governance […] [so we should think how] to explore places of convergence and contact or of even mutual legitimate pretermission, up to the completion of the whole task, in the course of time, thanks to which the say of our Lord and God and Savior Jesus Christ regarding one flock and one shepherd shall be fulfilled, bringing common joy and profit”(27). Patriarch Joachim III was likewise an innovator in the broader sense, as he purported to alter old and assured Church norms; despite His sojourn in Mt. Athos (1889-1901), one that His admirers tend to illustrate as similar to the ascetic struggles of the Holy Fathers(28) , “he made the following suggestions: that fasting be softened and consumption of eggs and milk be allowed; that church services be shortened; the attire of clerics be modified; the Gregorian calendar be adopted and marital prohibitions be reduced”(29) . It seems that His conduct in general, as also His followers’ and associates’ scandalous, pernicious and authoritarian behavior earned Him the reputation of a Mason among His enemies, as it goes in a relevant narrative(30) . Patriarch Meletios IV (Metaxakis), Metropolitan of Kition, Cuprus (1910- 1918); Metropolitan of Athens (1918-1920); Patriarch of Constantinople (1921-1923) and of Alexandria (1926-1935). Meletios’ case is by far the most typical of the intimate connection of Freemasonry and Ecumenism in its early stages, and of all its concatenations in various fields, especially in politics. Patriarch Meletios’ reputation as an influential Freemason circulated while he was still alive. The Freemasons’ Lexicon by Austrian Freemasons Eugen Lennhoff and Oskar Posner, already in its initial version of 1932 refers to Meletios as an emblematic figure amidst Orthodox Christian Clerical Freemasons(31). I find it significant that this information was given out while Meletios Metaxakis was still alive and actually not very old (b. 1871 – d. 1935). Furthermore, in an obituary written in 1967 by his friend and fellow Mason Alexandros Zervoudakis and published in the official journal of the Greek Freemasonry, Meletios is praised, because he “…received the Masonic light in the beginning of 1909. He remains in Constantinople for one more year and passionately studies the Masonic doctrine, which enabled him to schedule in a truly Masonic fashion all of his deeds and words, as we saw over our short narration of his activity. On any occasion, his justness and true Masonic virtues naturally and spontaneously, one would say, would guide him in what to say and how to act – an immense example of Masonry’s effect upon the formation of human character, when one is prepared to accept in one’s soul its teachings, i.e. when one is born a Mason, as was Meletios. After his initiation Brother Meletios would observe Masonic sessions and activity in every place he found himself in his eventful life, whenever circumstances and his environment would allow him to do so”(32) . Holy Elder Filotheos Zervakos of Paros, in the course of years would time and again put the blame on Meletios for the introduction of the Gregorian Calendar into some of the local Orthodox Churches (which caused multiple subsequent schisms thereafter), and openly name him a Freemason; in a written reprimand, an article, addressed to Patriarch Athenagoras, Elder Filotheos notes that one would have expected “that you would attend to the restoration of unity in our Church, in which division and schism was brought about by the unprepared, aimless, untimely and devilish innovation, i.e. the introduction of the Gregorian (Papal) Calendar, undertaken by your Masonic predecessor Meletios Metaxakis, who allured Chrysostomos Papadopoulos, Archbishop of Athens at the time”(33). Indeed, the adoption of the New Calendar served as a means for approach with Western Christian denominations, exactly as had declared the famous Encyclical of 1920, addressed to all Orthodox Churches by the Ecumenical Patriarchate: “This friendship and beneficent mutual disposition can be made manifest and corroborated, in our opinion, specifically in the following ways: a) by the adoption of a common calendar, so that all churches celebrate the great Christian feasts coincidentally”(34). Meletios himself, three years later, declared that “Among the issues which will occupy us, we have also listed the ones that pertain to the union of all Churches, especially the union between the Orthodox and the Anglican Church. This is why we salute your Grace [Charles Gore, former Bishop of Oxford] with special joy, as the President of the committee which works in London for the same purpose”(35). As is evident in the transactions of this same Pan-Orthodox Conference held in Constantinople in 1923, Meletios entertained the same “progressive” ideas that had been upheld also by Patriarch Joachim III (36). Upon his death on July 27th 1935, The Church Times (of 2.8.195) in its necrology commented: “Had his ambition been granted him, that of becoming Patriarch of Jerusalem, he would have held in his own person almost every great see in the ancient Orthodox Church. In every post he made no secret of his principles as a conservative reformer, letting it be known in America that he would welcome a married episcopate, that would not have to be drawn only from the failing reservoir of the monasteries, and that he could envisage short hair and “clerical dress” as a substitute for the not very ancient monastic robe worn by the Orthodox priests of to-day […] and was able to take the first great over step towards Anglo- Orthodox intercommunion by his official recognition of Anglican Orders, as “fully as good as those of Rome”. If he desired the Throne of Jerusalem, it was because he felt that he could spend the last years of his life in carrying out the necessary and unwelcome reforms there”(37). In the same way, that some 25 years later Patriarch Maximos V (1946-1948) would be un-canonically overthrown from the See of Constantinople, and Patriarch Athenagoras I, also a Freemason, would ascend to power assisted by his “Masonic brother” US President Harry Trumann (by means of psychological pressure exerted on Maximos by the Governments of Greece, Turkey and the USA – facts which lay outside the scope of this paper), Meletios’ rise to the Patriarchal Throne was also marked by a series of canonical violations and political intervention and actually turned out to be an ecclesiastical coup! The Greek Freemasonic journal Pythagoras, official magazine of the Grand Lodge of Greece, has revealed some very interesting information on the standing of Freemasonry among the Greeks of Constantinople in the early 20th century: “Simultaneously, the broad participation of the Lodge members not only in the C.O. [Constantinopolitan Organization], but also in the S.N.M.C. (Standing National Mixed Council) is impressive, since it [the S.N.M.C.] was in a way the unofficial Government of Constantinople’s Romanity and also an immediate associate of the Ecumenical Patriarchate. Undoubtedly, the Primate of the Ecumenical See and the people around Him were aware of the Masonic status of some of the S.N.M.C. members; nevertheless, the social status of these individuals did not allow for placing them in doubt. After all, their position in the Council was elective and would come into force through elections carried out in local communities” (38).With this analysis, the S.N.M.C.’s contribution to Meletios’ rise to power assumes a whole different meaning. The celebrated Greek theologian (and expert in dogmas) Chrestos Androutsos (1869-1935), famous also for his mastery of philosophy, shortly after Meletios’ enthronement published his own canonical assessment of the electoral procedure. Among other violations, professor Androutsos stigmatized the un-canonical exemption from the electoral process of many legitimate electors who resided in the countryside, on the pretext of the ongoing war between Greece and Turkey: “Most of them were not elected by their compatriots of their eparchy, according to the order that has always been kept in every 9 eparchy, and as the aforementioned Conciliar encyclical demanded, but were elected among the Christians of Constantinople who came from the eparchies. Maybe it would have been sufferable, if the representatives of the eparchies under Kemal’s occupation had been elected in Constantinople. Contrary to all reason and law, though, the representatives of other eparchies too were elected in Constantinople, without the participation of the eparchies themselves, and some of them were elected by the [electoral] conference itself” (39). This resulted in the formation of a pro-Meletios minded board of electors, since the substitutes for all those representatives who had not made it to Constantinople for the election-day were elected in Constantinople, under the influence of the S.N.M.C. Thus, the composition of the board was greatly altered in favor of Freemason Meletios! According to The Times: “Meletios is a man whose character and career command our interest […] then, in 1921, came a call to higher office, with his election, under the influence of Venizelist partisans, to the Patriarchate of Constantinople”(40). This and all other canonical violations were brought forward and condemned at a conference in Thessaloniki (December 1921), convened by “renegade” Bishops41, but to no avail. Patriarch Meletios was to remain an Ecumenical Patriarch until he had completed his ruinous task. ● Nikolaos Luvaris, professor of Theology (1887-1961). He is considered to be one of the greatest thinkers of modern Greece(42). His Freemasonic status is affirmed in a series of esteemed Masonic editions(43). Nikolaos Luvaris was furthermore one of the founding members of a Spiritists’ Society, called Committee for the Research of Meta-psychical Phenomena (Ἐπιτροπὴ Μελέτης Μεταψυχικῶν Φαινομένων) (44), which actually comes quite natural, if one should recall that the founder of modern Theosophy, Helena Petrovna Blavatsky and numerous other Thesophists, early in their spiritual venture, were active as spiritists and mediums(45). Professor Luvaris, among his other works, oversaw the publication of a fundamental work of 20th century occultism, The Great Initiates, compiled by the French author and former Theosophist Édouard Schuré (1841-1929), a Luciferian and devoted disciple of German founder of Anthroposophy Rudolf Steiner (a former Rosicrusian; Steiner commended Schuré’s theatrical play The Children of Lucifer(46)). In this collective work (by Éd. Schuré, C. Potter, K. Mimikos, R. Rolland, L. Fischer, Funck & Brentano) the founders of all religions are collectively labeled as “initiates” (not even “initiators”) and put on the level, as though they were legitimate exponents of a common, world-wide, religious spirituality. Even though Luvaris distances himself from the way the story of Jesus is presented by Éd. Schuré and C.F. Potter in this book(47), he doesn’t act accordingly as regards the narrative about Moses, into which C.F. Potter inserted many occult elements, attributing magical powers to Moses and Aaron and depicting the Mosaic religion as an amended amalgamation of primitive, barbaric customs and superstitions(48). Luvaris also prefaced another of Schuré’s works, From Sphinx to Christ. An Occult History, wherein the author appraises Lucifer’s contribution to human and universal evolution. Schuré writes: “In the Judeo-Christian tradition the struggle in heavens is called “The Fall of Lucifer”. This incident, which preceded and caused Earth’s creation, was not a random occurrence. It constituted a part of the divine plan; the decision about it, though, was left to the Forces’ initiative […] Lucifer is not Satan, the Spirit of Evil, as was portrayed by the orthodox and folk tradition […] We shall see further below, why Lucifer, the Spirit of Knowledge and free Individuality, was as necessary in the world as Christ, the Spirit of Love and sacrifice; how the entire human evolution stems from their competition; how, finally, their ultimate and higher harmony must crown man’s return to divinity” (49) . .Nonetheless, in his prologue in this very book professor Luvaris speaks of Édouard Schuré as an “inspired herald of the afterworld […] amiable philosopher and poet […] an elect troubadour of poetry and redemption, enthusiastic interpreter of humanity’s great nostalgia” (50). Professor Nikolaos Luvaris fiercely defended the introduction of religious studies, especially the psychology of religion, in the syllabus of Greek Theological Schools(51); it is clearly seen in his writings that, in defense of religion, he chose to utilize religious studies and the psychology of religion instead of dogmas and patristic teachings. He intended to demonstrate in a scientifically approved manner the global character of the religious phenomenon and, hence, its ontological innateness in human existence; his apparent intention was to attack positivism. However, this indiscriminate elevation by Luvaris of the religious phenomenon, manifest in various forms of mysticism, but regardless of denominational affiliations, naturally obscured the division between Orthodoxy and heresy; he noted: “It is true that many people scathe the use of psychology in theology, especially the elevation of the knowledge of psychological types and of the variety in their religious manifestations, as an exaggeration, as psychologism, as a biased – only from their subjective, psychological perspective – understanding of religious phenomena. This is par excellence the case with Dialectic Theology. However, it overlooks the fact that not only differentiations in religiosity are also a work of God, but also one’s negligence to know the psychological types and the variety of their religious expressions leads to extremes, albeit contrary to those which psychologism poses as a threat” (52). Among the sources utilized by psychology of religion, professor Luvaris enumerates “fourth: biographies of excellent religious figures, of such quality as we find in the books of the Holy Bible, the Bio of Plotinus, of Porphyrius, in the sources of Buddha’s biography, in the hagiology of the Middle Ages” (53). Luvaris’ touchstone for the evaluation of religious phenomena is not the rudder of the patristic “mind”, but … modern psychology (! ): “After all, in historical theology lies a great treasure of psychic facts and phenomena of inner experience, dreams, visions, prophecies, ascetics’ movements, heresies, forms of church communion. Comprehension of the psychology of religion and, consequently, of the inner causality of the soul’s religious life, contributes to the diagnosis of their nature, motives and aims; thus, it renders them explorable from within and averts the danger of their being overlooked, in the presumption that they are phenomena impervious to reason” (54). One cannot fail to notice that the founder of modern Theosophy, Helena P. Blavatsky, also thought of psychology as an instrument for the demythologization and re-evaluation of religious truths: “… the difference in creeds and religious practice was only external […] It is for philology and psychology to find the end of the thread. That done, it will then be ascertained that, by relaxing one single loop of the old religious systems, the chain of mystery may be disentangled” (55). Luvaris’ ecumenist legacy has been upheld by his favored disciple, professor Evangelos Theodorou (1921 – ), of the avant-garde of Greek Ecumenism; I think it is quite telling that professor Theodorou (unknowingly, I hope) has occasionally voiced New Age concepts and slogans, as for example “Unity in Diversity”(56), that were first introduced in the West by H. P. Blavatsky and her spiritual descendants(57). ● Dimitrios Balanos, professor of Theology (1877-1959). Balanos’ capacity as a Freemason remains largely unknown to this day, and was made known to the writer only through the afore-mentioned diary notes of professor Karatheodori(58). Balanos’ specific scholarly contribution to Ecumenism has yet to be adequately surveyed; undoubtedly, “he was one of the first to engage with the problems of the rapprochement between Christian Churches; and not only did he compose relevant treatises, as “The Need for Cooperation Among the Churches” (1932) and “The Greek Church and Her Relations with the Other Churches”(1940), but he also participated in the ecumenical conferences of Copenhagen, Stockholm, Losanne and Prague” (59). Professor Balanos was viewed by some more conservative professors as a rationalist, whose “dogmatic writings contain nothing notable, because they were based on western prototypes. Because he was imbued with a spirit of rationalism he himself was not content with his occupation with dogma didactics and, thus, turned to other fields […] he was destitute of the ability to delve deeply into the patristic spirit and to commend persons and ideas […] His interest in the Ecumenical Movement and in [forging] a tight connection between the Church and the world was great”(60). Balanos’ relativistic views with regard to Church dogmas are evident in that he undervalued the significance of the Palamite controversy; in his own words “It is sad indeed that so much ink was shed and that an issue so contradictory to our intellect occupied – with so great passionateness on both sides – men that were otherwise illustrious in their time, even despite the fact that the State was in grievous circumstances”(61). This non-withstanding, his case is of particular interest to us for an additional reason. It helps us grasp the defensive mechanisms within the Masonic infiltration, its carefully preserved “immune system”, against Church counter-attacks. Professor Balanos, together with five more academic theologians (Alivizatos, Papamichael, Dyovouniotes, Sotiriou and Stephanides) issued an extensive “expert evaluation” regarding the much debated religious character of Freemasonry. The evaluation, issued by this six-members committee, was prompted by a preceding appeal of the Greek Church (2530/1593 of 04.11.1932) to the School of Theology in Athens. The Committee acquitted Freemasonry, in stating as a conclusion that “there’s no reason why the Orthodox Church should come in conflict with Masonry, since, moreover, most of its members maintain an unbreakable link with the Mother Church, faithful children of which they wish to remain” (62). Today we know that at least a third of the Committee, two professors, were actually Freemasons (Alivizatos and Balanos). Τhis exonerative evaluation was adamantly rejected by the Holy Synod, in favor of professor Panagiotes Bratsiotis’ (1889-1982) evaluation, which was independently submitted and adopted by the Church, and in which Freemasonry was characterized as a religion incompatible with Christianity, carrying on ancient mystical movements and detrimental to Christian self-understanding(63). Balanos’ posterior personal testimony as to the harmlessness of Masonic teachings and their compatibility with Christianity was exploited by official Greek Freemasonry to counterbalance not only professor Bratsiotis’ harsh criticism against the “Royal Art”(Freemasonry), but its subsequent condemnation by the Greek Church in 1933 (12th of October) as well. Among the documents that Greek Freemasonry used, to refute the Greek Church’s accusations, there was an article by professor Balanos, published in the Christian journal Regeneration («Ἀνάπλασις») in July 1934, which voiced his mind that “I can’t understand why we forcefully insist on making a religion of Masonry. Even if Masonry claimed to be a religion, it would be the duty of the Orthodox Theological School to repudiate so totally baseless and absurd a claim, since Masonry comprises none of the basic terms, of which the notion of religion consists” (64). Professor Balanos at the time was supposed to be a neutral observer of this confrontation; he even went so far as to declare that “I admit that I would never join a Society which does not clearly and completely expose what pertains to its affairs, and that never have I felt any tendency to – or inclination for – the super-mystical and supersymbolic principles of Masonry, which anyhow I don’t regard as conforming to the spirit of our era, which demands light and publicity” (65) (!) Today we know he was just another pawn in this great chessboard of occult infiltration and that he should be a constant reminder to us of the devious methods used by Secret Societies to achieve their subversive goals. ● Amilkas Alivizatos (1887-1969), professor of Theology, assistant – in a later period – to Patriarch Athenagoras I of Constantinople (b.1887 – d.1972) and a prominent figure in the Ecumenical Movement. Professor Alivizatos’ Masonic status has been revealed in the Greek Masonic journal Pythagoras(66). Furthermore, the former Great Master (1981-1995) of the Grand Lodge of Greece, Chrestos Maneas in his first ever public speech, on Cyprus, in 1990, confirmed the rumor that professor Alivizatos had been a Freemason(67). Characteristically enough, young theologian Alivizatos in the 1910s served as an assistant(68) to the afore-mentioned Freemason Meletios Metaxakis, former Metropolitan of Athens (1918-1920) and Patriarch of Constantinople and Alexandria, together with Archdeacon Athenagoras (a Freemason, too), later to become Metropolitan of the Greek Orthodox Archdiocese in the USA and finally Ecumenical Patriarch (1948-1972). Alivizatos’ contribution to Greek Ecumenism is so huge and self-evident, that any attempt to adequately portray it would prove as time-consuming and meaningless, as to try to prove Nelson Mandela’s part in bringing down Apartheid! In the words of his friend (and fellow Mason) Methodist Bishop G. Bromley Oxnam(69) (member of WCC’s administration), “His scholarship has made a fundamental contribution to the ecumenical movement and his penetrating mind has been a decisive factor in developing the unity that characterizes the great Christian bodies that cooperate in the World Council of Churches […] His experience as scholar, patriot, and Christian has made him one of the influential and inspiring figures of the Christian world” (70). According to another account “he may be considered the first ecumenically acclaimed Orthodox theologian and factor of the Ecumenical Movement and of the exposure of Orthodoxy therein” (71). Alivizatos became the mentor of another devoted Ecumenist, professor Savvas Agourides (1921-2009), prominent among Alivizatos’ disciples, who in turn instructed a multitude (a leading majority now) of modernist, leftist (of the New Left), “politically correct”, radical and iconoclastic Ecumenists, many of whom are today theologians in Greek universities. Professor Agourides’ conversion to the religious movement of the Korean “messiah” Sun Myung Moon (founder of the “Unification Church”), many years before Agourides’ death (2009), was officially condemned by the Church of Greece in 1996. Out of four Departments of the Theological Schools in Athens and Thessaloniki, only one, the Department of Pastoral Theology of Thessaloniki (albeit without naming the professor’s name), acceded to the Greek Church’s request to take sides with Her for this condemnation(72). The concurrent presence and action of Masonic- and ecumenist-minded Hierarchs and theologians in the Greek world, coincided also with the commencement of early globalization procedures, spearheaded by other prominent and influential Freemasons and Theosophists. About the end of the 19th century, in 1893, soon before Joachim III opened the door to Orthodox ecclesiological flexibility and looseness, the Parliament of Religions, convened at Chicago, Illinois, in 1893, had prepared the ground for subsequent inter-religious approach; the strong presence of Theosophists therein was more than obvious, and they openly worded their expectations and plans: “The Parliament of Religions formally opens on Monday, September 11th, and we are assigned to the following Friday and Saturday, September 15 and 16, 1893 […] Our orators are eloquent, our writers convincing. Where can they find a better opportunity to spread the Theosophic idea than right here in this wonderful Parliament of Religions, the meeting-place of the best minds in Europe and America, the intellectual centre towards which in this year of 1893 all the culture of the world will turn […] whose sessions will form a grand historical event, marking the change from the old dispensation of darkness and dogmatism to the new era of light, liberty of thought, and religious expression, and, above all, the spirit of universal fraternity with which the Theosophical Society is animated, and of which it is indeed the standard-bearer?” (73). Early ecumenical activity within the Protestant world, aimed at better organizing charity and mission, gained immense support by the Rockefeller Dynasty, who purported to manipulate the Ecumenical Movement and, through the work of John Mott, to utilize clerics and politicians alike in order to unite “in common purpose and work the coming leaders of the Church and State in all lands”(74). The key-role of Mott, founder of the Y.M.C.A., dominates this era, and, not to our great surprise, Mott was a member of the Alpha Beta Kappa brotherhood, considered to be a branch of the German Illuminati(75). Mott’s reputation with the Greek Ecumenists has been inordinate (Alivizatos, for instance(76) ). Their early coaction brought about the emersion of the World Council of Churches. Anyhow, the first denomination with which Greek Orthodox Ecumenists established ecclesial relations, was the Anglican; but Anglicanism had been early on infiltrated by Freemasonry; in a Greek Masonic article of 1934 actually, Freemasons boasted that three fourths of the Anglican Clergy were then Masons(77). The patterns for religious globalization, i.e. Ecumenism, were laid through the paradigm of the League of Nations. Patriarch Meletios Metaxakis, intended to bolster synergy between the League of Nations and global Orthodoxy, as his words in the Conference of 1923 implied, where Meletios in a subtle way tried to submit the Orthodox Churches to the authority of the League of Nations: “The Ecumenical Patriarchate, when It will have come in contact with the Orthodox Churches, and taking their opinion into consideration, shall declare to the League of Nations that the Orthodox Church is willing to adopt the new calendar, whose invention is underway, on condition that all Christian Churches should embrace it. In case the League of Nation holds itself unauthorized to accept such a declaration of the Ecumenical Patriarchate, it falls to It [the Patriarchate] to act duly“(78). Ecumenist historians too, in their own narrative of early Ecumenism, usually stress the fundamental urge of post-WWI western societies to cement religious tolerance and reconciliation and to so avoid one more “War to end all wars”(79). The League of Nations was admittedly manned by Freemasons; the Greek Masonic Review Pythagoras («Πυθαγόρας») states: “A vivid example for us Greeks is the Society of Friends and, among modern Masonic efforts, the League of Nations, the Annual International Peace Congress, Near East Relief, the Young Men Christian Association and countless other humanitarian and cultural organizations” (80); indeed, to this day, lists of Freemasons lay claim to numerous members of the League of Nations(81). In delineating the connection between Ecumenism, Freemasonry and politics, embodied in some very significant advocates of the ecumenical cause (even though our paper is more of a broken narrative, because our research is still in progress), we mean to also engrave in the reader’s mind the fact that tolerance, as understood by Freemasons, in the sense of embracing all religions(82), is a sine qua non of their mentality: “The conception of the hypothetical character of all truths, illustrates the liberating motive alongside the Freemasonic idea of tolerance […] The most important duty of Freemasonry is, through education, foremost education of its own members, to bring tolerance to the massive proceedings, which are intolerant in themselves, scourged by irresponsible leaders. Through this mission it [i.e.Freemasonry] participates – in an exceptional way – in the spiritualization and pacification of social changes and it is in these terms called to be a more important factor of culture, if it is to do justice to its mission. Thus, the Lodge has no greater duty than education for tolerance”(83). The all-too-obvious tenaciousness with which Ecumenist clergy and intelligentsia have so far promoted and continue to bulldoze their agenda, regardless of all obstacles that meet them, maybe a serious sign that the involvement of Freemasonry and the Globalists in the Orthodox Church affairs is far from over. Endnotes  Πρακτικὰ τῆς Προκαταρκτικῆς Ἐπιτροπῆς τῶν Ἁγίων Ὀρθοδόξων Ἐκκλησιῶν τῆς συνελθούσης ἐν τῇ ἐν Ἁγίῳ Ὄρει Ἱερᾷ Μεγίστῃ Μονῇ τοῦ Βατοπεδίου (8-23 Ἰουνίου 1930), ἐν Κωνσταντινουπόλει 1930, p.73· « 3) Τὸ ζήτημα τοῦ Ἐλευθέρου Τεκτονισμοῦ. Ἡ Μεγάλη Ἐκκλησία Κωνσταντινουπόλεως ἐσημείωσεν ἐν τῷ Καταλόγῳ αὐτῆς αἱρέσεις τινὰς ὀνομαστί, ὡς τὸν Οὐνιτισμόν, Χιλιασμόν, κ.τ.λ., ἀλλ΄ ὁ Μασωνικὸς κίνδυνος ὑπερβαίνει πάντας, καὶ δυστυχῶς ἱκανοὶ τῶν διανοουμένων εἶνε συνδεδεμένοι μετ΄ αὐτοῦ. Οὗτος εἶνε ὁ νέος Ἀρειανισμὸς καὶ ἐνώπιον ἡμῶν πρόκειται μέγας ἀγών, ὃν ὀφείλομεν ἄνευ φόβου νὰ ἀναλάβωμεν ἐν ὀνόματι τοῦ Θεοῦ. Ὁ μεγαλύτερος κίνδυνος τοῦ Χριστιανισμοῦ ἐν τῷ κόσμῳ δὲν εἶνε ὁ Μπολσεβικισμὸς ἢ ἄλλο τι, ἀλλ΄ ὁ Τεκτονισμός, διότι εἶνε ἐχθρὸς ἐξωτερικὸς καὶ ἐσωτερικός. Ἡμεῖς λέγομεν ὅτι ἡ Χριστιανικὴ Θρησκεία εἶνε ἡ Θρησκεία, ἡ μόνη Θρησκεία, καὶ ἡ Ὀρθοδοξία ἡ μόνη ἀληθής, αὐτοὶ δ’ ἀρνοῦνται τὸ Εὐαγγέλιον καὶ τὸν Χριστόν, θέτοντες αὐτὸν ἐν ἴσῃ γραμμῇ πρὸς τὸν Μωϋσῆν, τὸν Βούδδαν, τὸν Μωάμεθ» (excerpt from the transactions of the 3 rd Session, June 10, 1930, within the Suggestions of the Serbian Mission). Ibid, pp. 121.127.128.144. ΑΛ. ΔΡΕΜΠΕΛΑΣ, Τὸ ἑλληνικὸ ἀστυνομικὸ πρόβλημα, Ἀθήνα 1970. Citation derived from Κ. ΤΣΑΡΟΥΧΑΣ, Η Μασονία στην Ελλάδα, εκδ. Πεδίο, Αθήνα 2012, p. 78: «Εἰς τεκτονισμὸν ἀνήκουν πλεῖστοι διανοοούμενοι, πολιτικοί, 16 δικαστικοί, ἀνώτεροι κρατικοὶ λειτουργοί, ἀξιωματικοί, οἰκονομικοί παράγοντες, ὅλοι οἱ εὔποροι Ἑλληνοαμερικανοὶ καὶ ἀρχιερεῖς ἢ θεολόγοι. Οἱ τελευταῖοι, καταστάντες τέκτονες ὡς ἰδιῶται θεολόγοι, προωθήθηκαν ἐπιμελῶς εἰς ἱεραρχίαν Ὀρθοδοξίας καὶ ὑπῆρξαν οἱ πλέον ἐθνικοὶ καταστροφεῖς. Ἡ Στοὰ Ἀθηνῶν μέχρι τὸ 1963 εἶχε Μέγαν Διδάσκαλον τὸν πρύτανιν τοῦ Πανεπιστημίου καὶ καθηγητὴν Θεολογικῆς Σχολῆς καὶ στὴ συνέχεια πρώην δικηγόρον». Π.Ν. ΤΡΕΜΠΕΛΑΣ, Μασσωνισμός, ed. Ἀδελφότης Θεολόγων «Ὁ Σωτήρ», Ἀθῆναι 19865 , pp. 250-252. ΧΡΙΣΤΟΔΟΥΛΟΣ ΠΑΡΑΣΚΕΥΑΪΔΗΣ (Μητροπολίτης Δημητριάδος), Ἱστορικὴ καὶ κανονικὴ θεώρησις τοῦ Παλαιοημε- ρολογιτικοῦ Ζητήματος κατά τε τὴν γένεσιν καὶ τὴν ἐξέλιξιν αὐτοῦ ἐν Ἑλλάδι, ἐκδ. Ἐκκλ. Βιβλιοθήκη Ἱ. Μητρ. Δημητριάδος, p. 168.169. For instance in p.169 «… μαρτυρεῖ τήν αὐθαίρετον ἀλλ’ οὐχὶ καὶ ἄδολον συσχέτισιν τῶν δύο τούτων ὑποθέσεων, τῆς «διορθώσεως» δηλονότι καὶ τῶν σκοτίων δυνάμεων, πρὸς τὸν σκοπὸν δημιουργίας ὑπὲρ αὐτῶν ἐντυπώσεων […] Ἀλλ’ ἡ ἀπὸ τοῦ 1924 διαρρεύσασα μεγάλη χρονικὴ περίοδος, ἀπέδειξεν ὅτι ἡ γενομένη «διόρθωσις» τοῦ ἡμερολογίου δὲν εἶχε σχέσιν τινὰ πρὸς τὸν Οἱκουμενισμόν, ἐνῷ ἀναπόδεικτα παραμένουσι τὰ περὶ τῆς τεκτονικῆς ἰδιότητος τῶν δύο Πρωθιεραρχῶν». Agethen, while actually downplaying, I believe, the overall potential of the Illuminati Society to take over state institutions or overturn them revolutionarily, nonetheless confirms many of its secret goals and actual achievements: “Insbesondere an diese “Funktionselite zwischen Bürgertum und Adel” knüpfte sich im Orden [d.h. im Illuminatenbund] die Hoffnung auf die innere Absorbierung des Staates – ein Programm, das zwar durch das jesuitisch vorgebildete Prinzip des ,unus ex nostris’ verschwörerischen Anstrich bekam, das aber, reduziert auf seinen relativ bescheidenen Kern, nichts anderes bedeutet, als die der Aufklärung insgesamt geläufige Vorstellung von praktischer Reformarbeit aus öffentlichen Ämtern heraus […] Nach Weishaupts Vorstellung sollten in der Ordensgemeinschaft eine neue Moral, Politik und Religion geschaffen werden. Dazu mußte man die Mitglieder zunächst den Ordnungen der alten Welt entziehen, mußte sie nach der Art sektiererischer Bewegungen in Konventikeln für ihre historischpolitische Rolle vorbereiten, die Elite der Zukunftsgesellschaft zu sein und den Durchbruch in die neue Ethik zu schaffen” (M. AGETHEN, Geheimbund und Utopie. Illuminaten, Freimaurer und deutsche Spätaufklärung, R. Oldenbourg Verlag, München 1984, pp. 297.300. Agethen’s book was prefaced by Heinz Lott, Master of the Research Lodge Quator Coronati Nr. 808, of the United Grand Lodges of Germany). “Le Droit humain (France)”, https://fr.wikipedia.org/wiki/Le_Droit_humain_%28France%29  V. STAUFFER, New England and the Bavarian Illuminati (submitted in partial fulfilment of the requirements for the degree of Doctor of Philosophy in the Faculty of Political Science) Columbia University, New York 1918, p. 159: “[Through the work of the Illuminati] The pure religion of Christ, which, doctrinally conceived, had degenerated into asceticism and, from the institutional standpoint, had become a school of fanaticism and intolerance, was pronounced a doctrine of reason, converted into a religion for no other purpose than to make it more efficacious”. J. D. BUCK, The Nature and Aim of Theosophy, Robert Clarke & Co., Cincinnati 1889, pp. 53.54: “But, it may be said, Christians are striving in the same direction; then what is the need of Theosophy and the Society? The answer is that so-called Christianity is altruism plus “orthodoxy”, that is, creeds, rites, ceremonies and litanies, and very often the ceremony serves only to obscure the altruism. Theosophy makes altruism only essential, and claims for each and every individual absolute liberty and perfect freedom to formulate any intellectual belief, or to repudiate all creeds, as seemeth to him best. Wit the warring sects of Christendom, as with other great religions, orthodoxy is considered essential […] Theosophy, therefore, means more Christianity and less orthodoxy; more altruism, more liberty, and less ceremony; more genuine worship of the Simple Truth, and fewer shams”. M. HALL, The Lost Keys of Freemasonry. The Legend of Hiram Abiff, Hall Publishing Company, Los Angeles 1924, pp. 94.95. G. STEINMETZ, The Lost Word. Its Hidden Meaning, Macoy Publishing and Masonic Supply Company, New York 1953, pp. 14.15: “The similarity of Modern Masonic and Rosicrucian Philosophy is so marked that their mutual source is obvious to the student of symbolism and philosophy. There is ample reason to suspect that modern Freemasonry was profoundly influenced by, if not actually the outgrowth of, Rosicrucianism and Bacon’s Secret Society. “Its symbolism is undoubtedly permeated with Bacon’s two great ideals; universal education and universal democracy” ”. R. M. LEWIS, Make Your Own Prophecies, Leisure Hour series, AMORC, San Jose CA 1942, p. 4. R. M. LEWIS, ibid, p. 13: “In other words, man will be put en rapport with a place in space, without moving from his armchair. He will enjoy as complete emotional and psychic response to the projected impressions he receives as if his immediate surroundings had been transformed into them […] What we now experience as radio and added to it what the imagination can conceive as accurate color television pictures can only provide us with a very crude idea of this future miracle we now predict”. AL. A. BAILEY, The Reappearance of the Christ, Lucis Publishing Company, New York 1964, pp. 122.142. 17  http://www.grandlodge.gr/ioakim-g-patriarxis-w-47113.html  Μ. ΦΥΣΕΝΤΖΙΔΗΣ, Επιφανείς και Διάσημοι Έλληνες Ελευθεροτέκτονες 1800-1970, vol. 1, ed. «Βογιατζή», Αθήνα 2008, pp. 165-169  Β.Α. ΛΑΜΠΡΟΠΟΥΛΟΣ, Τὸ Μαῦρο Λεξικὸ τῆς Ἑλλληνικῆς Μασονίας, μέρος β΄, ἐκδ. Βασδέκης, Ἀθήνα 2001, p. 170· «Ἰωακείμ ὁ Γ΄. Οἰκουμενικός Πατριάρχης Κωνσταντινουπόλεως, 1834, †1912. Εὐρυτάτης μορφώσεως καὶ ἀντιλήψεως ἱεράρχης, ἐπηδαλιούχησε μετὰ πραγματικῆς σωφροσύνης καὶ παραδειγματικοῦ θάρρους τὸ σκάφος τῆς Ἐκκλησίας ἐν μέσῳ δεινῶν σκοπέλων. Μυηθεὶς εἰς τὸν Τεκτ. ἐφήρμοσεν ἐμπράκτως τὰς ἀρχάς του ἐπιδείξας ψυχικὴν ρώμην ἀξιοθαύμαστον». Μ. ΦΥΣΕΝΤΖΙΔΗΣ, ibid, p. 169. Μ. ΓΕΩΡΓΙΑΔΟΥ, Κωνσταντίνος Καραθεοδωρή. Ένας μαθηματικός υπό τη σκέπη της εξουσίας, Ιστορία της Επιστήμης, Αθήνα 2007, p. 913 (Παράρτημα VI.Δ). Ἱστορικαὶ σελίδες. Δευτέρα Πατριαρχεία Ἰωακεὶμ τοῦ Γ΄, 1901-1906, pp.11-12  Θ. ΓΕΩΡΓΙΑΔΗΣ, Ὁ μεγάλος Πατριάρχης Ἰωακείμ Γ΄ στόν Μυλοπόταμο, ed. Μοναχός Ἐπιφάνιος ὁ Μυλοποταμινός, Ἅγιον Ὄρος 2012, pp. 26.27.  http://4.bp.blogspot.com/-C28lrCEcLT8/TyFq2fIRIbI/AAAAAAAACLQ/0funb7pAle8/s1600/CIMG0021.JPG  Θ. ΓΕΩΡΓΙΑΔΗΣ, ibid, p. 55· «Σύμφωνα μέ τήν νεκρολογία του στήν ἐφημερίδα Φιγκαρό, “ἡ μεγαλύτερη ἔγνοια του ἦταν μιά κατά τό δυνατόν στενότερη προσέγγιση μεταξύ τῶν τριῶν μεγάλων κλάδων τῆς Χριστιανοσύνης, δηλαδή τῶν Ὀρθοδόξων, τῶν Καθολικῶν καί τῶν Διαμαρτυρομένων. Ἐν ὀλίγοις, ἤδη ἀπό τίς πρῶτες ἡμέρες τῆς δεύτερης πατριαρχείας του ἀνέλαβε τόν ρόλο τοῦ γενικοῦ εἰρηνοποιοῦ μεταξύ τῶν χριστιανικῶν δογμάτων, βασίζοντας τίς ἐλπίδες του στήν ἐπιταγή Ἐκείνου πού εἶπε, “ὅσοι πιστεύουν σ΄ ἐμένα πρέπει νά ἀγαπῶνται σάν ἀδελφοί”». Also vide pp. 43.44. For an analysis thereof vide ΠΡΩΤΟΠΡ. Θ. ΖΗΣΗΣ, Ἁγία καὶ Μεγάλη Σύνοδος. Πρέπει νὰ ἐλπίζουμε ἢ νὰ ἀνησυχοῦμε; Φίλη Ὀρθοδοξία 14, ed. «Τὸ Παλίμψηστον», Θεσσαλονίκη 2016, pp. 23-48. Professor Fr. Theodore analyzes the polemical attribute of a series of Patriarchal Encyclicals (1836, 1838, 1848, 1868, 1895) against Papacy and Protestantism and compares them with later ecumenical declarations. ΙΩ. ΚΑΡΜΙΡΗΣ, Τὰ Δογματικὰ καὶ Συμβολικὰ Μνημεῖα τῆς Ὀρθοδόξου Καθολικῆς Ἐκκλησίας, vol. 2, Akademische Druck-u. Verlagsanstalt, Graz- Austria 1968, p. 946γ : «… κυρίως δι΄ αὐτῶν τε [i.e. the Encyclicals of 1902 and 1904] καὶ τῶν παραλειπομένων ἐνταῦθα ἀπαντήσεων τῶν Ὀρθοδόξων Ἐκκλησιῶν κατήρξατο ἡ Οἰκουμενικὴ Κίνησις ἤδη ἀρχομένου τοῦ ἐνεστῶτος αἰῶνος ἀπὸ τῆς Ὀρθοδοξίας, ᾗ ἠκλούθησε μικρὸν ὕστερον ὁ Προτεσταντισμός». St. John Chrysostom’s teaching on this topic is crystal clear, that this Lord’s promise has been fulfilled thanks to the gifts of the Pentecost to the Church: Εἰς τὸ κατὰ Ἰωάννην 82, 2 PG 59, 444· «Τί οὖν; ἤνυσεν αὐτό, φησί; Καὶ σφόδρα ἤνυσεν. Ἅπαντες γὰρ οἱ διὰ τῶν ἀποστόλων πιστεύσαντες ἕν εἰσιν͵ εἰ καί τινες ἐξ αὐτῶν διεσπάσθησαν». Ἡ περὶ τῶν σχέσεων τῶν Αὐτοκεφάλων Ὀρθοδόξων Ἐκκλησιῶν καὶ περὶ ἄλλων γενικῶν ζητημάτων Πατριαρχικὴ καὶ Συνοδικὴ Ἐγκύκλιος τοῦ 1902, ed. ἐκ τοῦ Πατριαρχκοῦ Τυπογραφείου, ἐν Κωνσταντινουπόλει 1904, pp. 8.9· «Θεοφιλὲς ἔτι καὶ εὐαγγελικόν ἐστι ἐπιζητῆσαι τὰ δοκοῦντα ταῖς ἁγιωτάταις αὐτοκεφάλοις Ἐκκλησίαις περὶ τῶν ἐν τῷ παρόντι καὶ ἐν τῷ μέλλοντι σχέσεων ἡμῶν μετὰ τῶν δύο μεγάλων τοῦ χριστιανισμοῦ ἀναδενδράδων, τῆς δυτικῆς δηλονοῦν καὶ τῆς τῶν διαμαρτυρομένων Ἐκκλησίας […] ἡ ἁγία, λέγομεν, Ἐκκλησία μία ἐστὶ πράγματι ἐν ταὐτότητι πίστεως καὶ ὁμοιότητι ἠθῶν καὶ ἐθίμων συνῳδὰ ταῖς ἀποφάσεσι τῶν ἑπτὰ οἰκουμενικῶν Συνόδων, καὶ μία ὀφείλει εἶναι, ἀλλ’ οὐ πολλαὶ καὶ διαφέρουσαι πρὸς ἀλλήλας κατά τε τὰ δόγματα καὶ τοὺς θεμελιώδεις θεσμοὺς τῆς ἐκκλησιαστικῆς διακυβερνήσεως […] ἐξευρεῖν τε σημεῖα συναντήσεως καὶ ἐπαφῆς, ἢ καὶ ἀμοιβαίων θεμιτῶν παροράσεων, μέχρι τῆς διὰ τοῦ χρόνου τοῦ ὅλου ἔργου τελειώσεως, δι’ ἧς πληρωθήσεται πρὸς κοινὴν εὐφροσύνην καὶ ὠφέλειαν ἡ περὶ μιᾶς ποίμνης καὶ ἑνὸς ποιμένος ρῆσις τοῦ Κυρίου καὶ Θεοῦ καὶ Σωτῆρος ἡμῶν Ἰησοῦ Χριστοῦ». Θ. ΓΕΩΡΓΙΑΔΗΣ, ibid, pp. 83-97.102-113·  Θ. ΓΕΩΡΓΙΑΔΗΣ, ibid, p. 52· «Ἐπιπλέον, πρότεινε τά ἀκόλουθα: νά ἐλαφρυνθοῦν οἱ νηστεῖες καί νά ἐπιτρέπεται ἡ ἀνάλωση αὐγῶν καί γάλακτος· νά περιοριστοῦν χρονικά οἱ ἀκολουθίες· νά ἀλλάξει ἡ ἐνδυμασία τῶν κληρικῶν· νά υἱοθετηθεῖ τό Γρηγοριανό ἡμερολόγιο· νά περιοριστοῦν τά κωλύματα τοῦ γάμου». Γ. ΛΟΥΚΑΣ, Σύντομος ἱστορία τῶν παρὰ τοῦ πρῴην πατριάρχου Ἰωακεὶμ τοῦ γ΄. ἀπεσταλμένων δύο κακούργων ἐξάρχων, εἰς ἅπαντα τὰ ἐν ἁπάσῃ Θεσσαλικῇ περειφερείᾳ ἱερὰ Μοναστήρια, διαπεπραγμένων, μικρὸν πρὸ τῆς προσαρτήσεως αὐτῆς παντοίων κακουργημάτων, ἐν Θεσσαλίᾳ 1885, p.12: «… ἀγκαλά οὐ μόνον οὐδὲ ποσῶς ἠρώτα 18 αὐτούς, ἀλλὰ καὶ ἔπραττε πᾶν ὅ,τι καὶ ἂν ἤθελεν ὁ ἀκέφαλος ἀθέμιτον καὶ ἀνόσιον, ὡς οὐκ εἶχεν ἄλλην παρὰ τοῦ μασόνου ἐκείνου πατριάρχου Ἰωακεὶμ τοῦ γ΄. ἐπὶ τῶν ἱερῶν ἐκείνων μονῶν ἐντολήν, εἰμή, ἵνα κλέψῃ, θύσῃ καὶ ἀπολέσῃ! … ὤ! Κύριε! Σῶσον δή!». E. LENNHOFF & O. POSNER, Internationales Freimaurer-Lexikon (unveränderter Nachdruck der Ausgabe 1932), Amalthea Verlag, Wien-München 1975, sp. 584.585: “4. Griechisch-orthodoxe” G. [Geistliche] Zahlreiche Priester und Bischöfe, auch mehrere Patriarchen gehörten, bezw. Gehören dem Bunde an. So der Griechische Nationalheld Erzbischof Germanos (s.d.) von Patras, der 1820 den griechischen Freiheitskampf vorbereitete und dann der provisorischen Regierung angehörte, und in der Gegenwart der Patriarch von Alexandrien, Meletius, der frühere ökumenische Patriarch von Konstantinopel”. ΑΛ. Ι. ΖΕΡΒΟΥΔΑΚΗΣ, «Διάσημοι Τέκτ.·. Μελέτιος Μεταξάκης», Τεκτονικὸν Δελτίον. Ὄργανον τῆς Μεγ.·. Στ.·. τῆς Ἑλλάδος 71 (Ἰαν. – Φεβρ. 1967) 49.50: «… ὁ Μελέτιος δέχθηκε καὶ τὸ τεκτ.·. φῶς κατὰ τὶς ἀρχὲς τοῦ 1909. Παραμένει στὴν Πόλη ἕνα χρόνο ἀκόμη καὶ μελετᾷ μὲ πάθος τὴν τεκτ.·. διδασκαλία, ποὺ τοῦ ἐπέτρεψε νὰ χαράξῃ μὲ πραγματικὰ τεκτ.·. τρόπο, ὅλες του τὶς πράξεις καὶ τὰ λόγια, ὅπως εἴδαμε κατὰ τὴ σύντομη ἐξιστόρηση τῆς δράσης του. Σὲ κάθε περίπτωση, ἡ δικαιοσύνη καὶ οἱ πραγματικὲς τεκτ.·. ἀρετές, θἄλεγε κανείς, φυσικὰ καὶ αὐθόρμητα τὸν ὡδηγοῦσαν τί νά πῇ καὶ πῶς νὰ ἐνεργήσῃ. Τρανὸ παράδειγμα τῆς ἐπίδρασης ποὺ ἔχει ὁ Τεκτ.·. στὴ διαμόρφωση τοῦ χαρακτῆρα τοῦ ἀνθρώπου, ὅταν αὐτὸς ψυχικὰ εἶναι προετοιμασμένος νὰ δεχθῇ τὰ διδάγματά του, ὅταν δηλ. εἶναι γεννημένος τέκτων, ὅπως ἦταν ὁ Μελέτιος. Ὁ ἀδ.·. Μελέτιος, μετὰ τὴ μύησή του παρακολουθοῦσε τὶς ἐργασίες καὶ τὴ δράση τοῦ Τεκτ.·. παντοῦ ὅπου βρέθηκε στὴν πολυτάραχη ζωή του, καὶ οἱ περιστάσεις καὶ τὸ περιβάλλον τοῦ τὸ ἐπέτρεπαν». «Ἡ ἕνωσις τῶν ἐκκλησιῶν», in Γέρων Φιλόθεος Ζερβάκος, ὁ Οὐρανοδρόμος Ὁδοιπόρος 1884-1980, vol. 1, ed. Ὀρθόδοξος Κυψέλη, Θεσσαλονίκη 1980, p. 288: «Θὰ προσεδόκει τις ὡσαύτως ὅτi θὰ ἐλαμβάνετε τὴν φροντίδα νὰ ἐπαναφέρητε τὴν ἑνότητα ἐν τῇ Ἐκκλησίᾳ ἡμῶν, ἐν τῇ ὁποίᾳ τὴν διαίρεσιν καὶ τὸ σχίσμα ἐπέφερεν ἡ ἀπρομελέτητος, ἄσκοπος, ἄκαιρος καὶ διαβολικὴ καινοτομία, ἤτοι ἡ εἰσαγωγὴ τοῦ Γρηγοριανοῦ (Παπικοῦ) ἡμερολογίου ὑπὸ τοῦ Μασώνου προκατόχου Σας, Μελετίου Μεταξάκη, παρασύραντος τὸν τότε Ἀρχιεπίσκοπον Ἀθηνῶν Χρυσόστομον Παπαδόπουλον». Cf. also ΠΡΩΤΟΠΡ. Θ. ΖΗΣΗΣ, Ὁ Ὅσιος Φιλόθεος ὁ Ζερβάκος ὡς ἀγωνιστὴς καὶ ὁμολογητὴς τῆς Ὀρθοδοξίας· μὲ ἀναφορὲς στὴν έπικαιρότητα, ed. Ὀρθόδοξος Κυψέλη, Θεσσαλονίκη 2014, pp. 78.79. Διάγγελμα τοῦ Οἰκουμενικοῦ Πατριαρχείου «Πρὸς τὰς ἁπανταχοῦ Ἐκκλησίας τοῦ Χριστοῦ» in ΙΩ. ΚΑΡΜΙΡΗΣ, Τὰ Δογματικὰ καὶ Συμβολικὰ Μνημεῖα τῆς Ὀρθοδόξου Καθολικῆς Ἐκκλησίας, vol. 2, Akademische Druck-u. Verlagsanstalt, Graz- Austria 1968, p. 958.959 [1056.1057]: «Δύναται δὲ ἡ φιλία αὕτη καὶ ἀγαθόφρων πρὸς ἀλλήλους διάθεσις ἐκφαίνεσθαι καὶ τεκμηριοῦσθαι εἰδικώτερον, κατὰ τὴν γνώμην ἡμῶν, ὡς ἑξῆς: “α’) διὰ τῆς παραδοχῆς ἑνιαίου ἡμερολογίου πρὸς ταυτόχρονον ἑορτασμὸν τῶν μεγάλων χριστιανικῶν ἑορτῶν ὑπὸ πασῶν τῶν Ἐκκλησιῶν”». Πρακτικὰ καὶ Ἀποφάσεις τοῦ ἐν Κωνσταντινουπόλει Πανορθοδόξου Συνεδρίου (10 Μαΐου – 8 Ἰουνίου 1923), ἐν Κωνσταντινουπόλει (ἐκ τοῦ Πατριαρχικοῦ Τυπογραφείου) 1923, pp.84.85: «Μεταξὺ ὅμως τῶν ζητημάτων, τὰ ὁποῖα θὰ μᾶς ἀπασχολήσωσιν, ἔχομεν καταγράψῃ καὶ τὰ ἀφορῶντα εἰς τὴν ἕνωσιν ὅλων τῶν Ἐκκλησιῶν καὶ ἰδιαιτέρως εἰς τὴν ἕνωσιν τῆς Ὀρθοδόξου καὶ τῆς Ἀγγλικανικῆς Ἐκκλησίας. Ἰδοὺ διατί χαιρετίζομεν μὲ ἰδιαιτέραν ὅλως χαρὰν τὴν Ὑμ. Σεβασμιότητα ὡς πρόεδρον τῆς ἐπιτροπῆς, ἡ ὁποία ἐργάζεται ἐν Λονδίνῳ πρὸς τὸν αὐτὸν σκοπόν». Radical and innovative (un-canonical) changes that were due, touched upon issues as significant as adultery, fasting, clerical attire, marital prohibitions, monastic tonsure (its inerasable attribute), age limits for Clerics etc. Vide Πρακτικὰ καὶ Ἀποφάσεις, ibid, pp. 174.173.172(158).162.155.154 respectively. “Death of Patriarch Meletios, peasant born Prince of Christendom” (by Our Special Correspondent), The Church Times (2.8.1935), in Α. ΤΗΛΛΥΡΙΔΗΣ, «Μελέτιος Μεταξάκης. Ἀνέκδοτα κείμενα», Texts and Studies. A Review for Hellenism in Diaspora 7 (1988) 284. ΙΩ. ΣΑΜΑΡΑΣ, «Ιστορία της Στοάς “Αρμονία” υπ΄ αριθ. 44 εν Ανατ. Κωνσταντινουπόλεως», Πυθαγόρας 101 (2011) 156 · «Παράλληλα εντύπωση προκαλεί και η ευρεία συμμετοχή μελών της Στοάς εκτός από την Ο.Κ. και στο Δ.Ε.Μ.Σ (Διαρκές Εθνικό Μικτό Συμβούλιο), τήν κατά κάποιο τρόπο ανεπίσημη Κυβέρνηση της Ρωμιοσύνης της Πόλης που ήταν ο άμεσος συνεργάτης του Οικουμενικού Πατριαρχείου. Αναμφισβήτητα ο Προκαθήμενος του Οικουμενικού Θρόνου αλλά και οι περί αυτόν, γνώριζαν την τεκτ. ιδιότητα κάποιων από τα μέλη του Δ.Ε.Μ.Σ, ωστόσο η κοινωνική θέση των ατόμων αυτών δεν άφηνε περιθώρια για τυχόν αμφισβήτησή τους. Άλλωστε η θέση τους στο Συμβούλιο ήταν αιρετή και προέκυπτε μετά από εκλογές που γίνονταν στις κατά τόπους κοινότητες». ΧΡ. ΑΝΔΡΟΥΤΣΟΣ, Ἡ ἐκλογὴ τοῦ Μητροπολίτου Μελετίου Μεταξάκη κανονικῶς καὶ κατὰ τοὺς Γενικοὺς Κανονισμοὺς ἐξεταζομένη, ed. «Προμηθεύς», ἐν Ἀθήναις 1921, p. 29: «Οἱ πλεῖστοι τούτων δὲν ἐξελέγησαν ὑπὸ τῶν ἐπαρχιωτῶν αὐτῶν κατὰ τὴν ἀνέκαθεν ἐπικρατοῦσαν ἐν ἑκάστῃ ἐπαρχίᾳ τάξιν, ὡς ἀπῄτει ἡ μνημονευθεῖσα ἐγκύκλιος τῆς Συνόδου, ἀλλὰ μεταξὺ τῶν ἐν Κωνσταντινουπόλει ἐκ τῶν ἐπαρχιῶν προερχομένων Χριστιανῶν. Καὶ ἂν μὲν ἐξελέγοντο ἐν Κωνσταντινουπόλει οἱ ἀντιπρόσωποι τῶν Κεμαλοκρατουμένων ἐπαρχιῶν, τὸ πρᾶγμα θὰ ἦτο ἀνεκτόν. Ἀλλὰ παρὰ πάντα λόγον καὶ νόμον ἐξελέγησαν ἐν Κωνσταντινουπόλει οἱ ἀντιπρόσωποι καὶ τῶν ἄλλων ἐπαρχιῶν, μηδαμῶς συμμετεχουσῶν αὐτῶν, τινὲς δὲ καὶ ἐξελέγησαν ὑπ΄ αὐτῆς τῆς συνελεύσεως». 19  “Meletios II, Orthodox Patriarch of Alexandria” (from a Correspondent), The Times (13.6.26) in Α. ΤΗΛΛΥΡΙΔΗΣ, ibid, 176. ΜΗΤΡ. ΔΡΑΜΑΣ ΑΓΑΘΑΓΓΕΛΟΣ, Τὸ Πατριαρχικὸν Ζήτημα. Ἡ ἐκλογὴ τοῦ Μεταξάκη. Τὸ Ἀρχιερατικὸν ἐν Θεσ/νίκῃ Συνέδριον 16-22 Δεκεμβρίου 1921, Δράμα 1922. Π. Κ. ΧΡΗΣΤΟΥ, Ἐκκλησιαστικὴ Γραμματολογία, τόμ. Β΄, ἐκδ. Κυρομᾶνος, Θεσσαλονίκη 20032 , p. 533: «Ὁ Νικόλαος Λούβαρις (1885-1961) εἶναι ὁ μεγαλύτερος θρησκευτικὸς στοχαστὴς τῆς νεωτέρας Ἑλλάδος». For instance Μ. ΦΥΣΕΝΤΖΙΔΗΣ, ibid, pp. 83-87 (which is an entry for Luvaris) and Β.Α. ΛΑΜΠΡΟΠΟΥΛΟΣ, ibid, μέρος α΄, ἐκδ. Βασδέκης, Ἀθήνα 2001, p. 237; Here, in the entry “Βραχμανισμός” (Brahmanism) professor Louvaris is referred to as a fellow Mason (a “Brother”): «Βραχμανισμός. Ἡ ὀρθόδοξος θρησκεία τῶν Ἰνδῶν. Κατά τόν ἀδ. Ν. Λούβαρην, ὁ βραχμανισμός εἶναι βαθμίς τῆς ἐξελίξεως ἐν τῇ Ἰνδικῇ θρησκείᾳ, ἡ διαδεχθεῖσα τήν βεδικήν». Κ.Ν. ΑΝΤΩΝΑΚΕΑΣ, Κοσμικοὶ κύκλοι· θέματα μεταψυχικῆς Νίκου Ἀ. Ἀντωνακέα, Ἀθῆναι 1967, pp. 106. Δ. ΜΑΓΚΡΙΩΤΗΣ, Θεοσοφία. Ἡ διδασκαλία καὶ αἱ πλάναι της, Ἀθῆναι 1967, pp. 48-51  R. STEINER, Der Orient im Lichte des Okzidents – Die Kinder des Luzifer und die Brüder Christi, Gesamtausgabe Vorträge, Rudolf Steiner Verlag, Dornach / Schweiz 1982, p. 21: “Nur das Kreuz ist es, das dem richtigen Verständnis Lebensmut und Lebensglauben gibt; der Stern aber ist es, der Stern, den einstmals Luzifer, der Lichtträger, inne-hatte, der aber diesem verlorengegangen und an das Christus-Prinzip übergegangen ist, der Stern, der uns in jedem Augenblicke erleuchten kann, wenn wir uns ihm hingeben, über die Richtigkeit, über das Unbezweifelbare unseres geistigen Inhaltes”. Οἱ Μεγάλοι Μῦσται, Βιβλιοθήκη Βιβλιογραφιῶν, ἐπιμελητὴς τῆς ὕλης Ν. Λούβαρης, Καθηγητὴς Πανεπιστημίου, ἐπιμελητὴς ἐκδόσεως Μιχ. Γ. Πετρίδης, ed. «Δέλτα», Ἀθῆναι, p. 249. Ibid, p. 62: «… καὶ ὅλοι παρακολούθησαν τὰ μαγικὰ παιχνίδια ποὺ ἔκαναν ὁ Μωυσῆς καὶ ὁ Ἀαρών» and p. 41: «Παραδέχτηκε καὶ ἀνέχτηκε πολλὲς δεισιδαιμονίες καὶ στοιχεῖα τῆς πρωτόγονης θρησκείας, ὅπως τὴ λατρεία τοῦ φιδιοῦ, τῶν φετίχ, τὴν ἀποδεικτικὴ δοκιμασία μὲ τὰ βασανιστήρια, γιὰ νὰ ἐξακριβώσῃ τὴν ἐνοχὴ ἑνὸς κατηγορουμένου, τὴν πολυγαμία, τὶς προσφορὲς τῶν μαλλιῶν, τὶς ξένες εὐχές, τὴν πίστη στὰ κακοποιὰ πνεύματα, τὴ μαγεία, τὴ θυσία τῶν πουλιῶν καὶ τῶν ζώων, τὴ φαλλικὴ λατρεία». ΕΔ. ΣΥΡΕ, Ἡ θεία ἐξέλιξις· ἀπὸ τῆς Σφιγγὸς μέχρι τοῦ Χριστοῦ, Βιβλιοθήκη Ξένων Κλασσικῶν 2, εἰσαγωγὴ Ν. Λούβαρι, μτφρ. Ἐπ. Μπούφαλι, ed. «Φάρος», Ἀθῆναι 1948, p. 66.67: «Εἰς τὴν ἰουδαιοχριστιανικὴν παράδοσιν ἡ πάλη εἰς τὸν οὐρανὸν καλεῖται “Πτῶσις τοῦ Ἑωσφόρου”. Αὐτὸ τὸ γεγονός, ποὺ προηγήθη καὶ προεκάλεσε τὴν δημιουργίαν τῆς Γῆς, δὲν ὑπῆρξε ἓν τυχαῖον περιστατικόν. Ἀπετέλει μέρος τοῦ θείου σχεδίου, ἀλλ’ ἡ περὶ αὐτοῦ ἀπόφασις ἀφέθη εἰς τὴν πρωτοβουλίαν τῶν Δυνάμεων […] Ὁ Ἑωσφόρος δὲν εἶναι ὁ Σατανᾶς, τὸ Πνεῦμα τοῦ κακοῦ, ὅπως τὸν παρέστησε ἡ ὀρθόδοξος καὶ λαϊκὴ παράδοσις […] Θὰ ἴδωμεν βραδύτερον διατί ὁ Ἑωσφόρος, Πνεῦμα τῆς Γνώσεως καὶ τῆς ἐλευθέρας Ἀτομικότητος, ἦτο ἐξ ἴσου ἀναγκαῖος εἰς τὸν κόσμον, ὅσον καὶ ὁ Χριστός, Πνεῦμα τῆς Ἀγάπης καὶ τῆς Θυσίας· πῶς, ὁλόκληρος ἡ ἀνθρωπίνη ἐξέλιξις προκύπτει ἐκ τοῦ ἀνταγωνισμοῦ των· πῶς, τέλος, ἡ τελικὴ καὶ ἀνωτέρα ἁρμονία των ὀφείλει νὰ ἐπιστέψῃ τὴν ἐπιστροφὴν τοῦ ἀνθρώπου εἰς τὴν θεότητα». Ibid, p. 16: «Τοιουτοτρόπως ἀπέβη ἐμπνευσμένος κήρυξ τοῦ Ὑπερπέραν […] τὸ περιεχόμενον τῆς πλουσίας συγγραφικῆς δημιουργίας τοῦ συμπαθοῦς φιλοσόφου καὶ ποιητοῦ. Εἶναι ὁ ἐκλεκτὸς ραψῳδὸς τῆς ποιήσεως καὶ τῆς λυτρώσεως, ἐνθουσιώδης ἐρμηνεὺς τῆς μεγάλης νοσταλγίας τῆς ἀνθρωπότητος». Μ. ΦΥΣΕΝΤΖΙΔΗΣ, ibid, p. 85. Ν.Ι. ΛΟΥΒΑΡΙΣ, «Ἡ ψυχολογία τῆς θρησκείας καὶ ἡ σχέσις αὐτῆς πρὸς τὴν Θεολογίαν», Θεολογία 23 (1952) 194: «Εἶναι ἀληθὲς ὅτι τὴν χρησιμοποίησιν τῆς ψυχολογίας εἰς τὴν θεολογίαν καὶ ἰδίᾳ τὴν ἔξαρσιν τῆς γνώσεως τῶν ψυχολογικῶν τύπων καὶ τῆς ποικιλίας τῶν θρησκευτικῶν των ἐκδηλώσεων, καυτηριάζουν πολλοὶ ὡς ὑπερβολήν, ὡς ψυχολογιαρχίαν, ὡς μονομερῇ θεώρησιν θρησκευτικῶν φαινομένων ἀπὸ τῆς ὑποκειμενικῆς μόνον, τῆς ψυχολογικῆς των πλευρᾶς. Τοῦτο πράττει πρὸ πάντων ἡ Διαλεκτικὴ Θεολογία. Παρορᾷ ὅμως ὅτι αἱ διαφοραὶ τῆς θρησκευτικότητος εἶναι καὶ αὐταὶ ἔργον τοῦ Θεοῦ, ὡς καὶ ὅτι ἡ παραμέλησις τῆς γνώσεως τῶν ψυχολογικῶν τύπων καὶ τῆς ποικιλίας τῆς θρησκευτικῆς των ἐκφράσεως ὁδηγεῖ εἰς ἀκρότητας, εἰ καὶ ἀντιθέτους πρὸς τὰς ἐκ τῆς ψυχολογιαρχίας ἀπειλουμένας». Ν.Ι. ΛΟΥΒΑΡΙΣ, ibid, Θεολογία 23 (1952) 33: «Τέταρτον, βιογραφίαι ὑπερόχων θρησκευτικῶν φυσιογνωμιῶν, οἵας ἔχομεν εἰς τὰ βιβλία τῆς Ἁγ. Γραφῆς, εἰς τὸν βίον τοῦ Πλωτίνου, τοῦ Πορφυρίου, εἰς τὰς πηγὰς τοῦ βίου τοῦ Βούδδα, εἰς τὴν ἁγιολογίαν τῶν μέσων αἰώνων». 20  Ν.Ι. ΛΟΥΒΑΡΙΣ, ibid, Θεολογία 23 (1952) 62.63: «Ἔπειτα εἰς τὴν ἱστορικὴν θεολογίαν πρόκειται μέγας πλοῦτος ψυχικῶν γεγονότων καὶ φαινομένων τῆς ἐσωτερικῆς ἐμπειρίας, ὄνειρα, ὁράσεις, προφητεῖαι, ἀσκητικαὶ κινήσεις, αἱρέσεις, μορφαὶ ἐκκλησιαστικῆς κοινότητος. Ἡ γνῶσις τῆς ψυχολογίας τῆς θρησκείας καὶ κατ΄ ἀκολουθίαν τῆς ἐσωτερικῆς νομοτελείας τοῦ θρησκευτικοῦ βίου τῆς ψυχῆς συμβάλλει εἰς τὴν διάγνωσιν τῆς φύσεως αὐτῶν, τῶν ἐλατηρίων καὶ τῶν σκοπῶν, καθιστᾷ οὕτω ἐρευνητὰ αὐτὰ ἐκ τῶν ἔνδον καὶ προφυλάττει ἀπὸ τὸν κίνδυνον τῆς παραμελήσεως αὐτῶν ὡς δῆθεν μὴ δεκτικῶν λόγου φαινομένων». H.P. BLAVATSKY, Isis Unveiled; A master-key to the Mysteries of Ancient and Modern Science and Theology, vol. 1 (Science), ed. J.W. Bouton, New York 1877, p.38. Vid. his article ΕΥ.Δ. ΘΕΟΔΩΡΟΥ, «Ἡ χριστιανικὴ ἑνότης μέσα στὴν ποικιλομορφία», Προβλήματα Θεολογικὰ- Φιλοσοφικά 26 (Ἰανουάριος 1978) 5-19 (edited by Jesuit Monks, ἐκδ. Μονὴ Πατέρων Ἰησουϊτῶν). K. HILLARD, An Abridgement of The Secret Doctrine by Helena Petrovna Blavatsky, The Quarterly Book Department, New York 1907, p. 555: “To the first of the two queries the answer is: We believe it because the first law in nature is uniformity in diversity, and the second-analogy”. Also, vide “The essential truth of Christianity” (by a Christian and a Theosophist), The Theosophical Path 5 (July-December 1913) 234: “Theosophy does not seek to make men all of one pattern; unity is only possible if there is diversity”. Μ. ΓΕΩΡΓΙΑΔΟΥ, ibid, p. 905 (Παράρτημα VI): «Δημήτριος Σ. Μπαλάνος, θεολόγος, πρύτανης Πανεπ. Αθηνών 1946, ακαδημαϊκός, Στοά Πυθαγόρας». Π. Κ. ΧΡΗΣΤΟΥ, «Μπαλᾶνος Δημήτριος», Θρησκευτικὴ καὶ Ἠθικὴ Ἐγκυκλοπαιδεία 9 (1966) στ. 146· «Ὁ Μπαλᾶνος ὑπῆρξεν ἐκ τῶν πρώτων τῶν ἀσχοληθέντων μὲ τὰ προβλήματα τῆς προσεγγίσεως τῶν χριστιανικῶν Ἐκκλησιῶν, ὄχι δὲ μόνον συνέταξε σχετικὰς πραγματείας, ὡς ἡ Ἀνάγκη τῆς Συνεργασίας τῶν Ἐκκλησιῶν (1932) καὶ Ἡ Ἑλληνικὴ Ἐκκλησία καὶ αἱ Σχέσεις της πρὸς τὰς ἄλλας Ἐκκλησίας (1940), ἀλλὰ καὶ μετέσχε τῶν οἰκουμενικῶν συνεδρίων Κοπεγχάγης, Στοκχόλμης, Λωζάννης καὶ Πράγας». Π. Κ. ΧΡΗΣΤΟΥ, Ἐκκλησιαστικὴ Γραμματολογία, ibid, p. 522: «Αἱ ἄλλαι δογματικαὶ ἐργασίαι του δὲν περιέχουν τίποτε τὸ ἰδιαίτερον, διότι στηρίζονται εἰς δυτικὰ πρότυπα. Ἐπειδὴ ἐνεφορεῖτο ὑπὸ ὀρθολογιστικοῦ πνεύματος, δὲν ἱκανοποιεῖτο καὶ ὁ ἴδιος ἀπὸ τὴν ἐνασχόλησιν μὲ τὴν δογματικὴν καὶ ἐστράφη πρὸς ἄλλα πεδία […] στερεῖται τῆς ἐμβαθύνσεως εἰς τὸ πνεῦμα τῶν πατέρων καὶ τῆς καταξιώσεως προσώπων καὶ ἰδεῶν […] Τὸ ἐνδιαφέρον του διὰ τὴν οἰκουμενικὴν κίνησιν καὶ διὰ τὸν στενὸν σύνδεσμον τῆς Ἐκκλησίας μὲ τὸν κόσμον ἦτο μέγα». Δ.Σ. ΜΠΑΛΑΝΟΣ, Οἱ Βυζαντινοὶ Ἐκκλησιαστικοὶ Συγγραφεῖς ἀπὸ τοῦ 800 μέχρι τοῦ 1453, ἐκδ. Ἀποστολικῆς Διακονίας, Ἀθῆναι 1951, p. 145· «Εἶναι ὄντως λυπηρὸν ὄτι τόση ἐχύθη μελάνη καὶ τόσον ἀπησχόλησε σπουδαίους κατὰ τὰ ἄλλα ἄνδρας τῆς ἐποχῆς, καὶ δὴ μετὰ τόσης ἑκατέρωθεν ἐμπαθείας, εἰς ἐποχὴν καθ΄ ἣν τὸ κράτος εὐρίσκετο εἰς τόσον δυσχερεῖς συνθήκας, ζήτημα “τόσον προσκροῦον εἰς τὴν ἡμετέραν λογικήν”». This view of his has been criticized by Protopresbyter Professor Theodore Zissis, ΠΡΩΤΟΠΡ. Θ. ΖΗΣΗΣ, Θεολόγοι τῆς Θεσσαλονίκης, Πατερικὰ 4, ed. «Τὸ Παλίμψηστον», Θεσσαλονίκη 2013, p. 113. Π.Ν. ΤΡΕΜΠΕΛΑΣ, ibid, p. 201: «Ἡ Ὀρθόδοξος Ἐκκλησία, εὐτυχῶς, οὐδέποτε διατρανώσασα τοιαύτας τάσεις, οὐδένα ἔχει λόγον νὰ ἔλθῃ εἰς σύγκρουσιν πρὸς τὸν Μασωνισμόν, ἐφ΄ ὅσον μάλιστα τὰ πλεῖστα τοὐλάχιστον τῶν μελῶν του εἶναι ἐν ἀδιαρρήκτῳ συνδέσμῳ πρὸς τὴν Ἐκκλησίαν, ἧς θέλουσι νὰ εἶναι πιστὰ τέκνα». Π.Ν. ΤΡΕΜΠΕΛΑΣ, ibid, pp. 203-224. Quoted (p.18) in a personal letter by Freemason Nicholaos Vourgides (later the Grand Master of the Grand Lodge of Greece) addressed to the Rev. Protopresbyter Professor George Metallinos on the 25th of April 2012 , kindly made known to the writer by its recipient. This article was refuted by ΑΡΧΙΜ. ΕΠΙΦ. ΘΕΟΔΩΡΟΠΟΥΛΟΣ, Ἡ Μασωνία ὑπὸ τὸ φῶς τῆς ἀληθείας, ed. Ἱ.Μ. Κεχαριτωμένης, Ἀθῆναι 19937 , pp. 110-112. ΑΡΧΙΜ. ΕΠΙΦ. ΘΕΟΔΩΡΟΠΟΥΛΟΣ, ibid, p.111: «Ὁμολογῶ ὅτι οὐδέποτε θὰ κατετασσόμην εἰς Σωματεῖον τὸ ὁποῖον δὲν ἐκθέτει σαφῶς καὶ πλήρως τὰ καθ΄ ἑαυτό, καὶ ὅτι οὐδεμίαν ᾐσθάνθην ποτὲ τάσιν ἢ κλίσιν πρὸς τὰς ὑπερμυστικιζούσας καὶ ὑπερσυμβολικιζούσας τῆς Μασωνίας ἀρχάς, ἃς ἄλλως δὲν θεωρῷ συμβιβαζομένας πρὸς τὸ πνεῦμα τῆς ἐποχῆς, ὅπερ ζητεῖ φῶς καὶ δημοσιότητα». Πυθαγόρας 31 (1990) 22; quoted in ΜΟΝΑΧΟΣ ΑΒΕΡΚΙΟΣ, «Αἱ σχέσεις Παπισμοῦ-Μασονίας κατὰ τοὺς τελευταίους αἰῶνας (Γ΄)», Ὀρθόδοξος Τύπος 2119 (03.06.2016) 5. Τί είναι η Μασωνία; (Ιστορική διάλεξη Χρήστου Μανέα, 1990) https://www.youtube.com/watch?v=OtBs0XAW4gc (vide after 1:10:00). Γ. ΚΟΝΙΔΑΡΗΣ, «Ἀλιβιζᾶτος Ἁμίλκας», Θρησκευτικὴ καὶ Ἠθικὴ Ἐγκυκλοπαιδεία 2 (1963) 161.162: «Κατὰ τὴν αὐτὴν ἐποχὴν (1918) μετέσχε τῆς ὑπὸ τὸν Μελέτιον ἀποστολῆς εἰς Ἀμερικήν […] Συνδεθεὶς ἐν Ἀμερικῇ μετὰ τῆς 21 Χριστιανικῆς Ἀδελφότητος τῶν Νέων καὶ τοῦ John Mott, ἐγένετο ἐν Ἑλλάδι ἐκ τῶν ἱδρυτῶν τῆς εἰρημένης ὀργανώσεως ἐν Ἀθήναις καὶ Θεσσαλονίκῃ». Vide ΜΟΝ. ΣΕΡΑΦΕΙΜ, «Ἡ Μασονία καὶ οἱ Πατριάρχες. Ἡ μασονικὴ προώθηση τοῦ Οἰκουμενισμοῦ», http://www.impantokratoros.gr/741CE610.el.aspx (endnote 66 refers to G. Bromley Oxnam). Vide B. Oxnam’s letter in Εὐχαριστήριον. Τιμητικὸς τόμος ἐπὶ τῇ 45ετηρίδι ἐπιστημονικῆς δράσεως καὶ τῇ 35ετηρίδι τακτικῆς Καθηγεσίας Ἁμίλκα Ἀλιβιζάτου, Ἀθῆναι 1958, p. λγ΄. λδ΄. Γ. ΚΟΝΙΔΑΡΗΣ, ibid, 163· «Ἕνεκα τούτων δύναται νὰ θεωρηθῇ ὡς ὁ πρῶτος ὀρθόδοξος οἰκουμενικῶς ἀνεγνωρισμένος θεολόγος καὶ παράγων τῆς Οἰκουμενικῆς Κινήσεως καὶ τῆς ἐν αὐτῇ προβολῆς τῆς Ὀρθοδοξίας»  «Ἡ ἄλλη πλευρά τοῦ Καθηγητοῦ Σάββα Ἀγουρίδη», Παρακαταθήκη 64 ( Ἰανουάριος-Φεβρουάριος 2009) 12.13  W. JUDGE, “Information for members of the T.S.” in The Theosophical Congress held by the Theosophical Society at the Parliament of Religions (World’s Fair of 1893, at Chicago, Ill., September 15, 16, 17) I Report of Proceedings and Documents, American Section Headquarters T.S., New York 1893, p. 7. A History of the Ecumenical Movement, 1517-1968, ed. R. Rouse and St.C. Neil, WCC, Geneva 19934 , p. 341· “Surely there has been no more hopeful development towards a real spiritual union of Christendom than the … Federation [i.e. the World’s Student Christian Federation], which unites in common purpose and work the coming leaders of the Church and State in all lands”. Vide also Fr. PETER A. HEERS, The Missionary Origins of Modern Ecumenism; Milestones Leading up to 1920, Uncut Mountain Press, Greece 2007, pp. 21-25. On the joint action of the Rockefellers, John Mott and various Ecumenical Organizations, as also on the Phi Beta Kappa brotherhood, vide ΜΟΝ. ΣΕΡΑΦΕΙΜ, ibid, endnotes 42 to 63. Γ. ΚΟΝΙΔΑΡΗΣ, ibid, 162 (vide above, endnote 65)  «Ἄδικος ἐπίκρισις τοῦ περὶ Τεκτ.·. ὑπομνήματος τῆς Θεολογικῆς Σχολῆς» Πυθαγόρας-Γνώμων (ἐπίσημον ὄργανον τοῦ Ὑπάτου Συμβουλίου τοῦ 33ου καὶ τῆς Μεγάλης Ἀνατολῆς τῆς Ἑλλάδος) Γ3 (Μάρτιος 1934) 89. Πρακτικὰ καὶ Ἀποφάσεις, ibid, p. 89: «1) Τὸ Οἱκουμενικὸν Πατριαρχεῖον συνεννοούμενον προηγουμένως μετὰ τῶν Ὀρθοδόξων Ἐκκλησιῶν καὶ ἔχον τὴν γνώμην αὐτῶν θὰ δηλώσῃ εἰς τὴν Κοινωνίαν τῶν Ἐθνῶν ὅτι ἡ Ὀρθόδοξος Ἐκκλησία προθύμως ἔχει ὅπως ἀποδεχθῇ τὸ μέλλον νἀ ἐξευρεθῇ νέον ἡμερολόγιον, ἐφ΄ ὅσον τοῦτο ἤθελον ἀποδεχθῇ πᾶσαι αἱ χριστιανικαὶ ἐκκλησίαι. Ἐὰν δὲ ἡ Κοινωνία τῶν Ἐθνῶν ἐθέωρει ἑαυτὴν ἀναρμοδίαν ὅπως δεχθῇ τὴν τοιαύτην δήλωσιν τοῦ Οἰκουμενικοῦ Πατριαρχείου, ἐπαφίεται εἰς αὐτὸ νά πράξῃ τὸ δέον». Cf. ΑΝ. ΒΑΣΙΛΕΙΑΔΟΥ, «Η γένεση της οικουμενικής κίνησης του 20ου αιώνα και η συμβολή της Ορθόδοξης Εκκλησίας» in Ιστορία της Ορθοδοξίας 8 (Η Ορθοδοξία σε διάλογο), p.236 : «Έτσι, ο πρώτος παγκόσμιος πόλεμος και τα επακόλουθά του, ο κόσμος που αναζητούσε νέο προσανατολισμό, η ίδρυση της Κοινωνίας των Εθνών (1919), η αναμέτρηση με τα ολοκληρωτικά συστήματα, ειδικά με το φασισμό, ενίσχυσαν την άποψη ότι οι εκκλησίες έπρεπε να βγουν από τη θεσμική τους απομόνωση και να κάνουν την οικουμενική υπόθεση δική τους […] για τον N. Söderblom αυτό ήταν ένα πνευματικό ερώτημα που αφορούσε στην αξιοπιστία των εκκλησιών και της μαρτυρίας τους». Πυθαγόρας 8 (Ἰανουάριος 1930) 13: «Ζωντανὸν παράδειγμα δι΄ ἡμᾶς τοὺς Ἕλληνας εἶναι ἡ Φιλικὴ Ἑταιρεία, καὶ ἐκ τῶν συγχρόνων τεκτονικῶν προσπαθειῶν, ἡ Κοινωνία τῶν Ἐθνῶν, τὸ Ἐτήσιον Διεθνὲς Συνέδριον Εἰρήνης, ἡ Near East Relief, ἡ Χριστιανικὴ Ἀδελφότης τῶν Νέων, καὶ ἄλλοι ἀναρίθμητοι ἀνθρωπιστικοὶ καὶ ἐκπολιτιστικοὶ ὀργανισμοί». Vide e.g. E. LENNHOFF & O. POSNER, ibid, sp. 213: “Bourgeois, Léon Victor Auguste, französischer Staatsmann, Pazifist und Verfechter der Menschenrechte […] ständiges Mitglied des Haager Schiedsgerichthofes, 1919 Erster Vorsitzender des Völkerbundrates”. Λεξικό Ελληνικής Μασονίας, vol. 1 (A-K), ed. Βιβλία για Όλους, Κύπρος, p. 21: «Αλεξανδρόπουλος Π. Ιωάννης ( ; – 1929): Διπλωμάτης, υπηρέτησε ως πρέσβης της Ελλάδος στη Σερβία το 1910 και αργότερα στην Πράγα. Ήταν ο πρώτος αντιπρόσωπος της Ελλάδος στην Κοινωνία των Εθνών». T. PAINE, “Rights of Man. Being an answer to Mr. Burke’s attack on the French Revolution (part I)” in The Political and Miscellaneous Works of Thomas Paine, vol. 1, London 1819, pp. 56.57 [531.532]: “Toleration is not the opposite of Intoleration, but the counterfeit of it. Both are despotisms. The one assumes to itself the right of withholding Liberty of Conscience, and the other of granting it […] Who, then, art thou, vain dust and ashes! By whatever name thou art called, whether a king, a bishop, a church, or a state, a parliament, or any thing else, that obtrudest thine insignificance between the soul of man and his Maker? Mind thine own concerns. If he believes not as thou believest, it is proof that thou believest not as he believeth, and there is no earthly power can determine between you”. 22  E. LENNHOFF & O. POSNER, ibid, sp. 1585: “Die Einsicht in die Bedingtheit aller Wahrheiten bildet bei der freimaurerischen Toleranzidee das auslösende Motiv. […] Die wichtigste Aufgabe der Freimaurerei ist, in das an sich unduldsame, von verantwortungslosen Führern aufgepeitschte Massengeschehen durch Erziehung, vor allem ihrer eigenen Glieder, T. zu tragen. Durch diese Mission wirkt sie an der Vergeistigung und Befriedung der sozialen Wechselbeziehungen in hervorragender Weise mit und ist in diesem Sinne berufen, ein wichtiger Kulturfaktor zu sein, wenn sie ihrer Sendung gerecht wird. Die Loge hat keine wichtigere Aufgabe, als die Erziehung zur Duldsamkeit”.